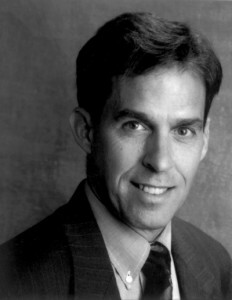 Pulitzer Prize-winning author Rick Atkinson. Join GHS in Savannah on May 20th for a conversation about the latest book in his Liberation Trilogy at Wesley Monumental, 6p.m. The event is free and open to the public. On May 20th the Georgia Historical Society is hosting Pulitzer Prize-winning author Rick Atkinson in Savannah to discuss The Guns at Last Light: The War in Western Europe, 1944-1945, the latest and final book in Atkinson’s Liberation Trilogy. In preparation for his visit, I have started reading the first book in the trilogy An Army at Dawn: The War in North Africa, 1942-1943. Not surprisingly, I have found that Atkinson’s vocabulary is much more advanced than my own, especially when it comes to military terminology. In search of a good online dictionary to aid in my quest to complete the trilogy before Atkinson’s arrival in May, I found a great online dictionary that does much more than look up words, it helps permanently add them to my mental lexicon. 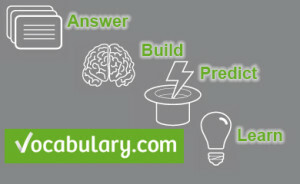 Vocabulary.com combines a lightning fast dictionary with an adaptive learning system they call “The Challenge” to provide students of all ages with the tools to become vocabulary masters. Did I mention that signing up for Vocabulary.com is completely free? You can sign up as an individual, teacher or student. As a teacher or student you can add your school to your account. The Leaderboards track individual and school accomplishments adding a dose of healthy competition to vocabulary building. Why do I LOVE Vocabulary.com? Let’s start with what brought me to the site in the first place, the dictionary. The Vocabulary.com dictionary uses predictive technology to get you to the definition you seek quickly. I have found that with just two letters typed in the search box the exact word I am looking for pops up in a list of options. It’s almost magical. Once you find the word you are looking for, you are offered an easy to understand explanation of what the word means and examples of how it is used. Vocabulary.com’s creators are interested in you learning the words you look up in their dictionary, not just using it for reference. This takes us to another function of Vocabulary.com that I LOVE, vocabulary lists. Every time I look up a word from An Army at Dawn I add it to a custom vocabulary list I created just for words from the book. You can enter words one at a time, enter up to 1,000 words at a time, or add them as you go like I do. There is also a function to let you create vocabulary words straight from text. Copy and paste up to 100 pages of text and Vocabulary.com will “grab vocab” for you. This screenshot shows how easy it is to create custom lists from primary sources. Social Studies teachers can use this tool to create custom vocabulary lists for primary and secondary sources. I tested it out with the opening paragraph of Memorial and Protest of the Cherokee Nation available through GHS’s Chapter by Chapter Primary Sources. In minutes I created a custom list of ten vocabulary words for this primary source. I made the list public so other users can access it. 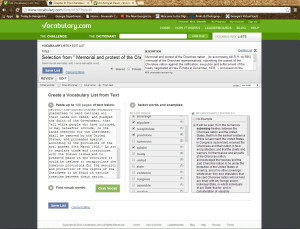 Vocabulary.com categorizes vocabulary lists and makes them available to browse and learn. Preparing for the SAT? You can access SAT prep lists for each letter of the alphabet. Right now, I am brushing up on my Latin roots with the help of a series of lists called Latin Love. Once you create or discover a list you want to learn, you can practice the words in just that list or add them to your Challenge. Now for the fun part, The Challenge. 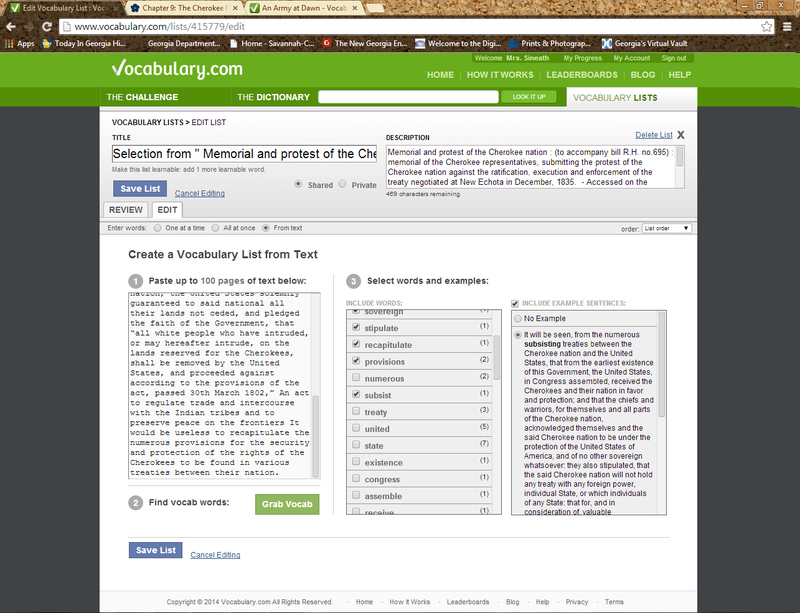 Using a proprietary technology they call Adaptive Vocabulary Instruction (AVI), Vocabulary.com uses their collection of more than 100,000 vocabulary questions to assess, monitor, and challenge individual users. Described as a “personal trainer for your brain,” The Challenge adapts and changes as your vocabulary grows. Four basic categories of questions (assessment, review, progress, mastery review) provide frequent exposure to words on your list. As you answer questions, a personal vocabulary list is built based on your ability level. You can manually add individual words or entire lists to your Challenge. As you complete challenges, you can monitor your progress towards mastering each word in your list. Users earn points and achievements as they play. I always loved getting stickers on my paper as a kid and there is something about earning digital badges that gets the kid in me excited about vocabulary. Vocabulary.com takes care of scaffolding and individualized learning for you. 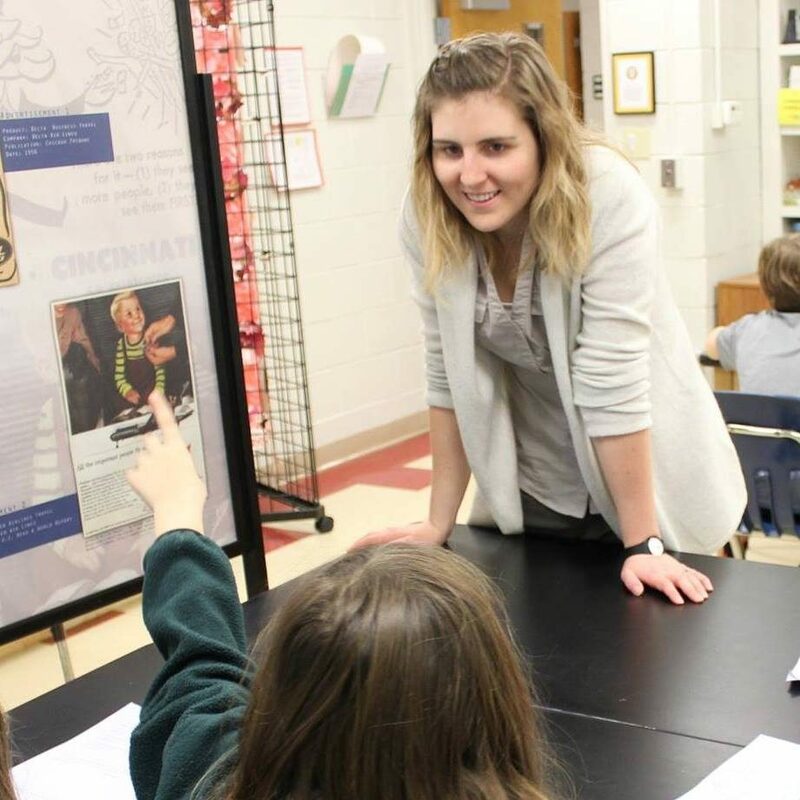 Automatic individualized learning based on real-time data. That sounds like a teachers dream! There are lots of tools out there for vocabulary building, but Vocabulary.com gets my enthusiastic recommendation! Check out this great resource and check back for more recommendations and videos on Sophia’s Schoolhouse.